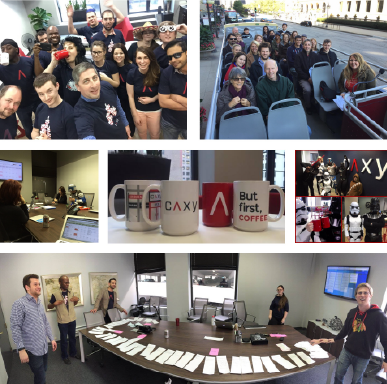 The digital developers and designers at Caxy Interactive have been serving clients from our Chicago office since 1999. Whether you are looking for a web design company to build a new site, application, or progressive web app, our team of experts is excited to help create a custom solution to meet all your needs. We’re a full-stack digital development company with a focus on user experience and Agile development. We love helping our clients innovate through better uses of technology, and to engage both new and existing customers in surprising ways. If you need digital development, Caxy will help identify where the best opportunities are through user-centered design and analytics and turn this into market-winning designs and enterprise-scale applications. We trust the Drupal CMS for web development projects because it is a proven, sophisticated platform with an enormous support community. Our team of Acquia-certified Drupal developers ensure clients’ websites fit their unique needs. The Symfony PHP framework allows our talented PHP developers to deliver durable and secure web applications quickly. Developers can focus less on code and more on creating the best user experience possible through this flexible application framework. We believe in working with you, not just for you. You can get started today by telling us about your next project. We’ll explain how we can help deliver a more secure, robust, and engaging solution. If you'd prefer to research Caxy Interactive on your own, you can learn more about our complete selection of web development and design services online. We'd love to chat about your project, and you can contact us via our web form — or call 312-207-6200. I’ve worked with Caxy over the last ten years, and they are extremely collaborative. Using the Agile method, each “sprint” is reviewed with the Project Owner prior to implementation, allowing for flexibility. The client is kept involved throughout and makes the final decisions. The staff is extremely knowledgeable — and the CEO, Mike LaVista, is honest and stays involved. You will not find a better digital strategy partner than Caxy. Caxy Interactive is a fun group that’s young and determined to show their chops. We couldn’t be happier. They’ve done a great job for us. The team has been very responsive and straightforward about what it’ll cost. They’ve always been under or within the budget. Work Culture? We have that.